Managers and business owners have plenty on their plates at any given time. There are always schedules to make, positions to fill, orders to place and decisions to make. In the chaos of running a business, it's important to remember to instill ethical behavior in all your employees. While it may take time out of your busy schedule, creating, teaching and maintaining professional standards in your business can be well worth the endeavor. While specific industries may have ethical questions unique to the field, there are some issues that managers from all businesses face. Whether you own a small local shop or manage an international team of professionals, it's important to consider the general moral questions that you should address and anything specific in your industry. What Is Ethical Behavior at Work? 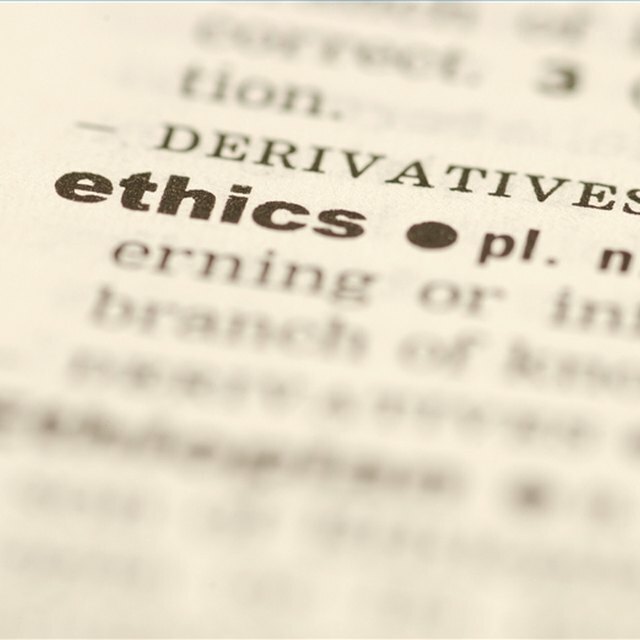 The term "ethical" can be nebulous and open to interpretation. Many people say that it's one of those things that you know when you see it or the lack of it. Because it can be difficult to define, it's essential for leaders to be specific when they say that they expect ethical behavior from their employees. More defined guidelines can help everyone get on the same page. Generally, ethical behavior is doing the right thing and adhering to professional standards. While this definition is a good start, it doesn't give specific guidance. That why it's essential to have a codified set of ethical standards for your business. This code can help to provide employees examples of moral quandaries they may face and ideas about how to handle these situations. If you are part of a professional association in your industry, this can be a great resource. Many of these organizations have guidelines that you can use. However, you may need to embark on a do-it-yourself journey for your ethical guide. If you can't find an industry-specific code of ethics or you don't agree with what you see, you can build a code of ethics yourself. Consider why you want to record your standards in the first place. If you keep in mind that this document should help guide employees in difficult situations, outline repercussions for ethical violations and create a positive company culture, you can write a code of ethics that will help your business thrive. While your industry may have unique ethical considerations, there are a few things almost all codes should address. For example, your written system should help employees decide what to do if a conflict of interest arises. Furthermore, your guidelines should discuss topics like social media, client privacy, privacy for colleagues, proprietary information, handling cash and submitting expenses. Your code of ethics should also clearly outline a protocol for when things go wrong. All employees should know who to tell if they witness unscrupulous behavior. Furthermore, they should know what will happen after they report it to you and that you will protect them from retaliation. Be transparent about how the process will work. Be sure to involve your human resources team in these decisions. Don't expect to come up with everything on your own. Instead, seek input from people throughout the organization. Any employee may have the ideas you need to make the right code of conduct. Once you have your code of conduct, don't be afraid to revise as necessary. Setting aside time each year to revisit your goals and rules can help keep your company ethical. While defining your expectations in a written code of ethics is an excellent start, it is not the only thing great leaders should do. Unfortunately, 60 percent of unethical conduct in the workplace involves a manager. Since both company culture and behavior come from the top down, it's essential to turn this trend around. All managers within your organization should display ethical behavior whether or not someone is watching. Ethical behavior, of course, starts with you. It can be downright impossible to get your employees to act morally if they see that you do no such thing. After all, it is difficult to take someone's advice seriously when she doesn't take it herself. Sometimes, you may not have the expertise to address a specific ethical question. That is why you should provide regular training for all employees. You can hire people who spend their lives studying and teaching these subjects. Furthermore, ongoing training can provide updated insight as the world changes. For example, the rise of social media has caused new ethical considerations for people in health care and other information-sensitive industries. With the new potential for HIPAA violations and information leaks, social media has become a hot topic in the business ethics world. While you must set rules and provide training, it is just as important to enforce your rules. Employees who violate your company's ethical standards should face appropriate repercussions. Sometimes, that may mean redirection or a verbal warning. For extreme violations, like sexual harassment or theft, you may need to let the person go or even take legal action. Either way, sticking to the consequences outlined in your code of ethics shows how serious it is to your business. The other side of the enforcement code is to recognize integrity when you see it. Sometimes, it can be difficult to make the right decision or even know what the ethical choice is. When you see an employee choose that path in the face of adversity, be sure to praise her, even if it's only in a private conversation. Finally, open and honest communication is key to creating an ethical business. If you find your business at a crossroads or if expectations change, leaders should make sure to talk to subordinates about the evolving situation. Similarly, managers need to ensure that all employees feel comfortable reporting unethical behavior that they witness. Since about half of all professionals see improper behavior each year, this practice can help you identify problems. If these standards are new to your business, don't try to drop it all on everyone all at once. Instead, try making incremental changes that are more likely to stick. For example, you can offer incentives through "nudge" programs. These plans last for a specified time limit, like a month or a quarter, and reward employees who exhibit certain behaviors in that time. Nudge programs can help everyone build new habits and feel like they are working toward something. Perhaps the best way to ensure that your organization keeps high standards is to hire people with good moral compasses in the first place. While you can't always be sure that someone is going to perform according to your standards, there are a few things to look for in an interviewee. First, look for people who tend to prioritize the needs of customers. When you ask him about his previous experiences, does he talk about how he ensured customer satisfaction or does he only talk about himself? Research shows that customer-centric people tend to have more ethical business practices. People who are assertive also tend to help create ethical company cultures. You may also ask questions in the interview about how she would handle specific moral issues that she may face in the position. Once a leader sets up ethical standards within the organization, the work is far from done. Even when employees understand what the manager expects, the leadership should perform routine maintenance on ethical standards in the business. One strategy is to include this subject in annual performance reviews, especially with senior staff. Review your managers not only on their ethics but also on how they encourage morals in their teams. You should also test reporting strategies and protocols. Use an audit, in which you purposely submit a fake claim, to see how it works in practice. After all, the plan could work much better on paper than in practice. Regular audits will allow you to identify problems and come up with solutions before something goes wrong for real. When reports of violations come in, a manager should reach out to the person who reported it immediately. Unfortunately, retaliation is a real possibility that these whistle-blowers face. In fact, 77 percent of management-level reporters experience retaliation, often within a few weeks of the report. When you reach out, be sure to ask about any retaliation. If she has experienced any, handle the situation swiftly. Corrupt behavior can take many forms, but there are a few immoral behaviors that come up frequently. Perhaps the biggest culprit is the misuse of company time. Some people may not realize that checking social media and making personal calls while on the clock is an ethical violation, but it can be. Furthermore, some people search for new jobs or work their side hustle while on the job. Unfortunately, abusive behavior is also a common immorality in the workplace. This behavior can take many upsetting forms, such as racism, misogyny, sexual harassment and emotional abuse. If you see this taking place in your business, it's important to address it immediately. You should contact a lawyer to learn about your options for recourse. You can avoid some of these problems with regular training and a zero-tolerance policy. Theft is another all-too-popular form of unethical behavior. Whether the employee takes products, forges checks or lies about their travel expenses, it is theft. Furthermore, employee theft is criminal. Open communication can help ensure that witnesses to these crimes feel comfortable coming forward. Business owners who allow unethical behaviors to run rampant risk ruining their businesses. While some effects are obvious and immediate, others take time and destroy the company slowly. For example, you may stop employee theft from immediately costing your business money, but an abusive employee can cost you even more in the long run. One way unethical behavior can hurt your business is by causing legal troubles. If you ignore blatant abuse, for example, you could end up facing a negligence lawsuit from the victim. Likewise, an accountant who cooks the books might save the business money initially, but that action could lead to significant legal trouble for all involved. Immoral behaviors can also affect your employees in ways that hurt the bottom line. After all, the best employees with high moral standards will often leave a company that does not meet those standards. As such, breeding a negative and unscrupulous culture can keep top talent out and give the business high turnover. Furthermore, the employees who do stay may feel defeated and unmotivated, which can suppress productivity. If news gets out that a company has sketchy professional practices, it can spell disaster for the bottom line. With more consumers paying attention to company ethics, one news story about improper behavior can sink a small business. Wiley: What Determines Ethical Behavior in Public Organizations: Is It Rules or Leadership?